»Culture & Arts»Teach Solais LGBT+ Resource Centre Fundraiser at NOVA on 29th! Teach Solais LGBT+ Resource Centre Fundraiser at NOVA on 29th! Don’t Forget! 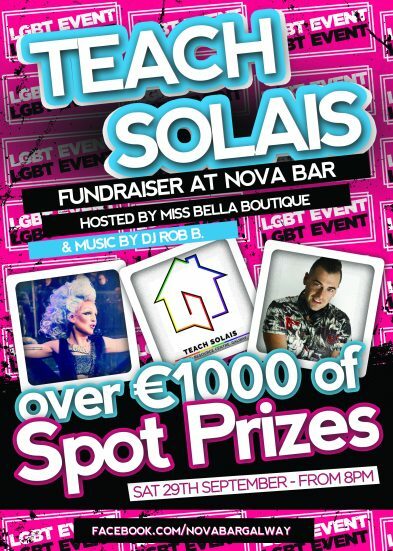 A FUNDRAISER for Teach Solais LGBT+ Resource Centre, with drag-queen Miss Bella Boutique as your host and music by DJ Rob B, is happening in NOVA bar this weekend, on Saturday Night 29th September, starting at 8pm. There will be over €1,000 of spot prizes at an event that has been organised by AMACH! LGBT Galway, with proceeds going to Teach Solais. Teach Solais, on Merchants’ Road Galway, is a hub for the LGBT+ community in both Galway city and the wider region, providing peer supports, information, and education, social, and cultural events. Teach Solais is the Galway base for the LGBT National Helpline; peer support groups including GOSSIP (transgender support group ) and Shout! Youth support group (18-25 years ) and hosts AIDS West’s free monthly HIV testing. Teach Solais also runs photography courses, meditation sessions, yoga classes, a book club, and drop-in sessions on Saturday.